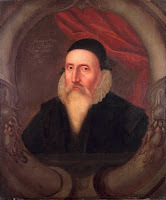 John Dee was one of the pre-eminent figures of Elizabethan England, Dee’s reputation became tarnished through his involvement with Edward Kelley (1555–1595). During the 1580s they travelled in Europe (possibly involved in espionage, or the rumoured network of secret societies said to have been founded by Agrippa), and the two men conducted a series of séances through which they claimed to be in touch with angels. The angelic communications were written in an angelic language, Enochian. The séances came to an end when one of the angels suggested wife swapping. Dee was also said to have found the Philosopher’s Stone in Glastonbury Abbey, while Kelley performed a successful transmutation at Trebona, Bohemia, on 19 December 1586. Dee may have been the inspiration for Prospero in Shakespeare’s The Tempest, and had one of the largest libraries in all of Europe at his house at Mortlake. Queen Elizabeth I was a visitor to Dee’s house but, after her death in 1603, he fell from favour and died in poverty, and his great library was broken up by collectors and creditors. Although Dr. John Dee’s reputation as a black magician may be undeserved, he seems destined to remain so categorized in the history of magic and the occult. Dee came from a family of means, and he was admitted to St. John’s College, Cambridge, when he was only 15. His application to his studies was intense, and he soon distinguished himself as a scholar. He slept only four hours per night, ate a light meal, participated in various forms of recreation for two hours, then used the remaining 18 hours for study. When he left Cambridge, he traveled to Holland to study with Mercator (1512–1594) and other learned men of his day. Returning home, he was made a fellow of Trinity College, and he gained a wide reputation as an astronomer. Dee left England again soon after acquiring fame as an astrologer and an astronomer, and he taught at many European universities. In 1551, he was back in England and was received by King Edward VI (1537–1553), who awarded him a pension of 100 crowns per annum. This stipend Dee later exchanged for a rectory at Upton-upon-Severn. During Queen Mary I’s (1516–1558) reign (1553–58), Dee was accused of trying to kill her by “enchantments.” He was seized, confined, and tried. After a long trial that lasted until 1555, he was at last acquitted. When Elizabeth I (1533–1603) ascended to the throne in 1558, she consulted with Dee as to which day the stars deemed the most propitious hours for her coronation. Pleased with his pronouncements, she continued to grant him the favor of her attention, and she made many promises of preferment—none of which were kept. Disillusioned by the intrigues of the English Royal Court, Dee left the country for Holland. In 1564 while residing in Antwerp, Dee published his greatest work, Monas Hieroglyphica. After he had presented a copy to the Emperor Maximilian II (1527–1576), Dee returned to England to produce more learned occult volumes. In 1571, while residing once again on the Continent, Dee fell ill. When Elizabeth heard of it, she sent two of her best physicians to attend to him. The queen also conveyed additional proofs of her high regard for him and made further promises. When he recovered, Dee returned to England and settled at Mortlake in Surrey. Here he accumulated an extensive library of works on occultism and allied subjects, prompting his neighbors to decree that he was in league with the devil. While Dee insisted that he did not practice black magic, it seemed apparent that he knew a great deal about the subject. By the early 1580s, Dee was growing dissatisfied with his progress in learning the secrets of nature and with his own lack of influence and recognition. He began to turn towards the supernatural as a means to acquire knowledge. Specifically, he sought to contact angels through the use of a "scryer" or crystal-gazer, who would act as an intermediary between Dee and the angels. Dee's first attempts were not satisfactory, but, in 1582, he met Edward Kelley (then going under the name of Edward Talbot), who impressed him greatly with his abilities. Dee took Kelley into his service and began to devote all his energies to his supernatural pursuits. These "spiritual conferences" or "actions" were conducted with an air of intense Christian piety, always after periods of purification, prayer and fasting. Dee was convinced of the benefits they could bring to mankind. (The character of Kelley is harder to assess: some have concluded that he acted with complete cynicism, but delusion or self-deception are not out of the question. Kelley's "output" is remarkable for its sheer mass, its intricacy and its vividness.) Dee maintained that the angels laboriously dictated several books to him this way, some in a special angelic or Enochian language. In 1583, Dee met the visiting Polish nobleman Albert Łaski, who invited Dee to accompany him on his return to Poland. With some prompting by the angels, Dee was persuaded to go. Dee, Kelley, and their families left for the Continent in September 1583, but Łaski proved to be bankrupt and out of favour in his own country. Dee and Kelley began a nomadic life in Central Europe, but they continued their spiritual conferences, which Dee recorded meticulously. He had audiences with Emperor Rudolf II and King Stephen of Poland in which he chided them for their ungodliness and attempted to convince them of the importance of his angelic communications. He was not taken up by either monarch. About ten years after Dee's death, the antiquarian Robert Cotton purchased land around Dee's house and began digging in search of papers and artifacts. He discovered several manuscripts, mainly records of Dee's angelic communications. Cotton's son gave these manuscripts to the scholar Méric Casaubon, who published them in 1659, together with a long introduction critical of their author, as A True & Faithful Relation of What passed for many Yeers between Dr. John Dee (A Mathematician of Great Fame in Q. Eliz. and King James their Reignes) and some spirits. As the first public revelation of Dee's spiritual conferences, the book was extremely popular and sold quickly. Casaubon, who believed in the reality of spirits, argued in his introduction that Dee was acting as the unwitting tool of evil spirits when he believed he was communicating with angels. He has often been associated with the Voynich Manuscript. Wilfrid M. Voynich, who bought the manuscript in 1912, suggested that Dee may have owned the manuscript and sold it to Rudolph II. Dee's contacts with Rudolph were far less extensive than had previously been thought, however, and Dee's diaries show no evidence of the sale. Dee was, however, known to have possessed a copy of the Book of Soyga, another enciphered book. After Elizabeth’s death, James I (1566– 1625) refused to extend patronage to Dee because of his troubled reputation as a practitioner of the dark arts. Dee returned to Mortlake, where he died in 1608 in a state of neglect and poverty. Dr. John Dee’s globes, magic stone, and other items of his occult practices may be seen today in the British Museum. He was a controversial figure at the time it. was in the days that European region is still strong faith in the supernatural world. same as Indonesia, which is still a strong belief in the supernatural (shaman). but nevertheless dee's an educated person, he was a lecturer:). however, was too careless dee expressed his belief in the supernatural that he understood. so, he considered unreasonable and approached the deceptive tricks.